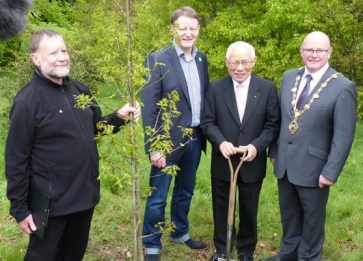 As part of our Biodiversity Week 2013 event schedule, Forest Friends Ireland, in partnership with Dublin North Rotary, launched the Cross Border Peace Forest project on May 26th which included a ceremonial planting of an oak tree by Sakuji Tanaka, president of Rotary international. 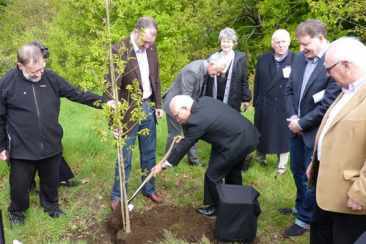 President Tanaka planted an oak tree at St. Columbs Park on Sunday morning as part of the Cross Border Peace Forest project - an initiative of Rotary Club Dublin North and Forest Friends Ireland, and the planting will be the begining of numerous plantings of native trees along the border. As a member of the first generation to grow up in Japan after WWII President Tanaka said he understood the importance of peace and the connection to our week being. "Peace is not something that can only be achieved through agreements by governments or through heroic struggles. It is something we can find and achieve every day and in many simple ways. 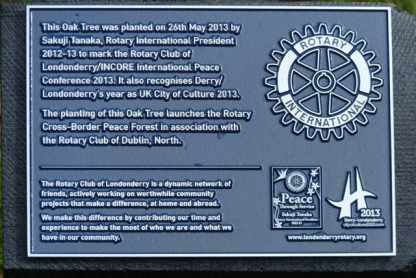 An oak tree was chosen as particularly significant being a symbol of Derry from which the Irish name Doire was derived. 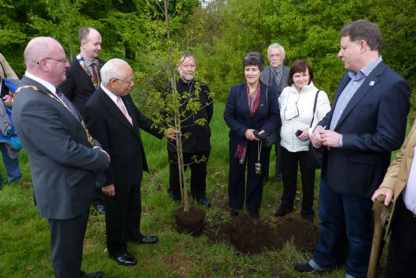 Forest Friends Ireland are encouraging communities and agencies all along the border to initiate tree plantings so that eventually there will be a great Peace Forest that all can be proud of, and that through tree planting projects communities on each side of the border will come to know each other better through community interaction.